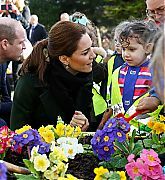 “I feel hugely proud today to be here today to become Patron of the Foundling Museum. 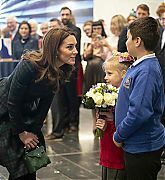 Your work connects and celebrates two subjects that are deeply important to me: children, and art. 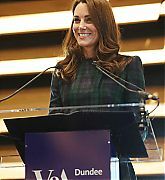 Today (March 19, 2019) The Duchess of Cambridge accompanied Her Majesty, The Queen on a visit to King’s College London to officially open Bush House, the latest education and learning facilities on the Strand Campus in London, England. 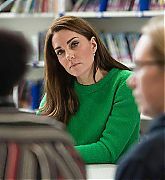 The Duchess is accompanied Her Majesty to see Bush House, a set of buildings which have been converted to include lecture theatres, teaching rooms, and an auditorium. 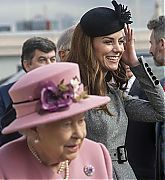 During the visit Her Majesty and The Duchess were able to tour the facility, on the Roof Terraces on the eighth floor of Bush House, The Queen and Duchess got to see the panoramic views of London. 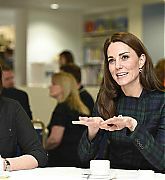 On the new virtual trading floor, The Queen and The Duchess met students from the Entrepreneurship Institute – which supports entrepreneurial thinking, skills and experiences amongst King’s students, staff and alumni. 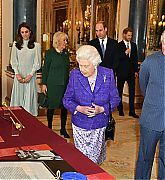 To end the engagement The Queen unveiled a plaque in the new auditorium, officially opening The Bush House and Her Majesty and Her Royal Highness sighed the Visitor’s Book. 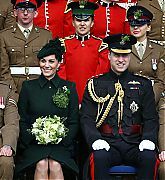 The Duke and Duchess of Cambridge attended the 1st Battalion Irish Guards St Patrick’s Day Parade at Cavalry Barracks in Hounslow, England. 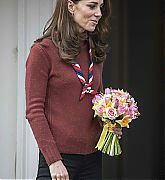 As in previous years The Duchess of Cambridge presented shamrocks to Officers, Warrant Officers, and the Irish Guard’s mascot Irish Wolfhound Domhnall. Before the parade a moment of silence was held for the victims of the horrific attack in Christchurch, New Zealand that killed 50 and injured dozens of others. 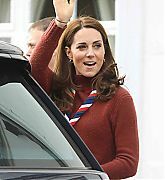 Afterwards, William and Kate met members of the Regiment and posed for the regimental photograph. 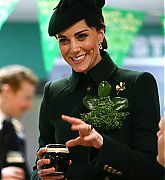 Inside the Guardsman’s lunch, The Duke and Duchess enjoyed a pint and mingled with soldiers in their mess hall. 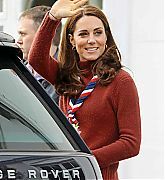 I’ve updated the gallery with photos from Catherine’s recent appearances. 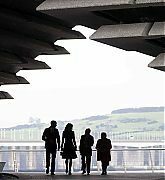 More photos will be added throughout the week, so keep checking back! Enjoy! 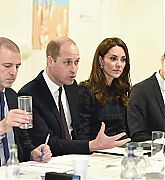 On day two of their visit to Northern Ireland The Duke and Duchess of Cambridge spent the day in Ballymena, meeting with organisations that are working to create a bright future for the next generation. 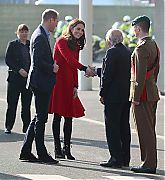 The couple started their day with a private meeting with Chief Constable of the Police Service of Northern Ireland, George Hamilton and police officers and police staff. 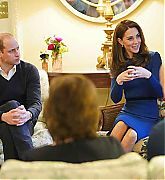 During the meeting they discussed the very challenging roles police undertake and thr support available to them. 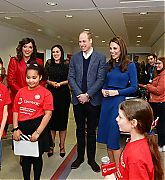 Next they couple visited the Cinemagic, a charity who uses film, television and digital technologies to engage with over 500,000 young people. 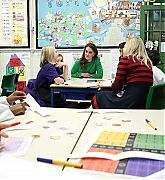 The charity uses visual arts to increase opportunities and develop skills for young people from all backgrounds. 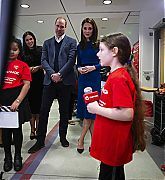 The Duke and Duchess took part in some of Cinemagic’s workshops to see the full range of training they provide. 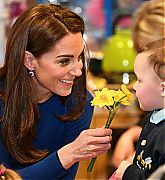 The day ended with a visit to Sure Start, a programme that supports parents with children aged under four years old living in disadvantaged areas in Northern Ireland. 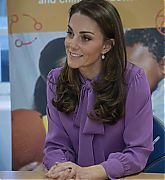 Their Royal Highnesses saw some of the different programmes that Sure Start provides to support parents and provide best practice for early years work. 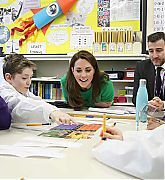 SURPRISE: The Duke and Duchess of Cambridge undertook a two day visit to Belfast, Fermanagh and Ballymena that celebrated the young people of Northern Ireland. 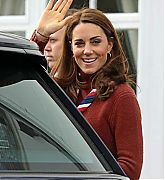 The visit was previously unannounced and was quite a surprise to many. 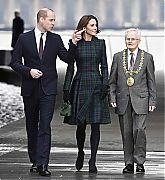 Their Royal Highnesses started their visit meeting waiting crowds in Belfast outside of the Windsor Park Football Stadium. 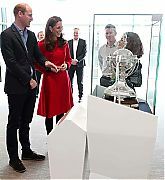 Inside, William and Catherine met Northern Ireland goalkeeping legend Pat Jennings and toured the Irish FA’s Education and Heritage Centre, they also viewed viewed the British Championship trophy, won by Northern Ireland won in 1984. 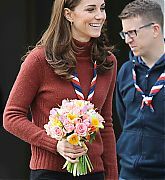 SHOOTING STARS: After a quick change of clothes it was time for the Duke and Duchess to hit the field. 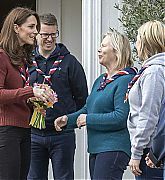 William and Catherine joined young girls from the Irish Football Association’s outreach programmes, ‘Shooting Stars’ which encourages young girls to play football and ‘Ahead of the Game’ which works to support clubs and volunteers when dealing with mental health issues, with a focus on challenging the stigma and preventative measures. 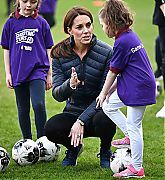 The Duke and Duchess chatted with the girls before joining them in a kickabout. 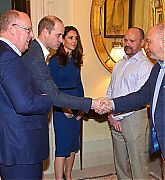 After all the fun, the Duke and Duchess were presented with Northern Ireland shirts for Prince George, Princess Charlotte and Prince Louis! 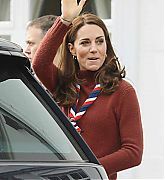 Before departing this engagement Willam and Catherine met with participants in ‘Ahead of the Game’ programme, officials and representatives from Irish Football Association. 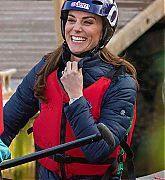 OUTDOOR FUN: For their next engagement the Duke and Duchess traveled to Fermanagh where they visited Extern’s Roscor Youth Village, a residential activity centre that provides a safe space to help and support young people and with a strong emphasis on supporting young people through outdoor activities and developing independent living skills. 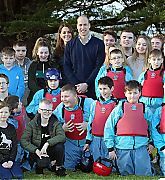 William and Catherine joined the young people in a number of activities, a few interestingly enough we’ve seen them take part in on a number of tours, like archery, and canoe racing. 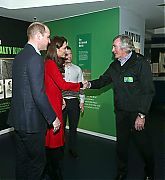 GET THE PARTY STARTED: For the evening engagement the Duke and Duchess were up to more adult activities as they attended a party at Empire Music Hall to celebrate young people who are making a real difference in Northern Ireland. 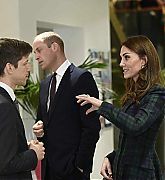 William and Catherine took turns pulling pints. 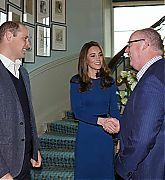 The Duke and Duchess were joined by representatives from Northern Ireland’s business, arts and sport sectors. 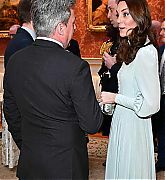 Hosted by the Queen’s representative Mrs Fionnuala Jay-O’Boyle CBE. 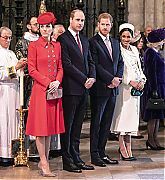 Dame Mary Peters was appointed Lady Companion of the Most Noble of the Garter by Her Majesty The Queen earlier in the day. 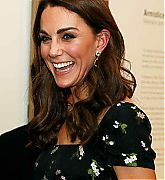 On (February 10) The Duke and Duchess of Cambridge attended 72nd British Academy Film Awards ceremony at the Royal Albert Hall. 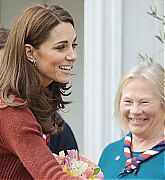 Upon their arrival they were greeted by BAFTA CEO Amanda Berry. 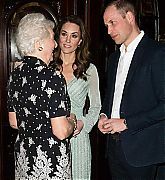 Prince William presented the Fellowship Award to American film editor Thelma Schoonmaker. 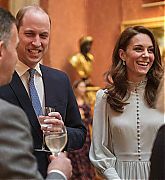 After the show The Duke and Duchess took a few moments to chat with the winners and nominees including, Spike Lee, Olivia Colman, and Rami Malek. 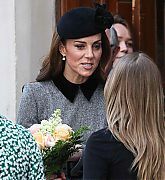 This morning, (January 16, 2019) Catherine, Duchess of Cambridge visited The Royal Opera House. 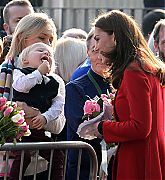 The Duchess was specifically interested in the Costume Department as her great great grandfather owned a textile mill. 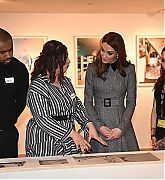 Today, The Duchess learned more about the textiles they use to create costumes and the commissioning of fabrics, design and craftsmanship involved. 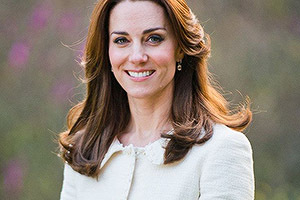 According to Kensington Palace this will be an area she will continue to explore this year: “Over the coming months, The Duchess will be exploring her interest in the use and manufacture of textiles through learning opportunities, visits to places like the Royal Opera House and meetings with industry experts.” During her tour, Fay Fullerton, The Royal Opera House’s Head of Costume, showed The Duchess ballet costumes – which are especially designed to allow dancers to move freely. 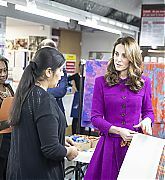 At the on-site dye shop The Duchess was showed different techniques including hand-painting and staining garments as well as how digital printing is used to reproduce historic fabrics. 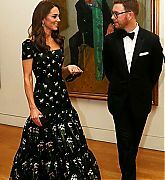 Catherine then met The Royal Ballet Principal Dancers Lauren Cuthbertson, Laura Morera, Tomas Mock and Vadim Muntagirov, who discussed some of the challenges of dancing in costumes. 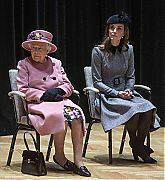 Afterwards, The Duchess watched the dancers rehearse Frederick Ashton’s ‘The Two Pigeons’.